Once, as Andre Hartman anchored near Dyer Island and Geyser Rock, a Greate White Shark came right up to the boat. It was not interested in the fish bait, however, but wanted to bite the outboard. Andre Hartman touched him on the nose and tried carefully to push him back. Then, he made a remarkable discovery: the Greate White Shark came further out of the water, pulled back its head and opened its mouth. As if in slow motion, it paused for a moment, only to return to its element. 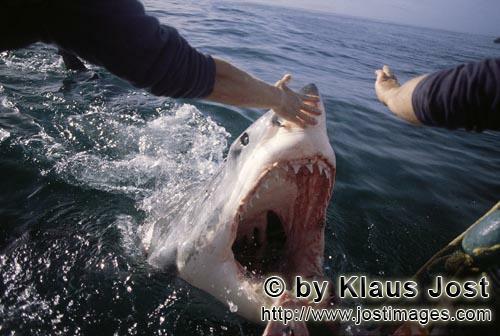 By chance, Andre Hartman had discovered how the Greate White Shark reacts when it is touched in this sensitive area. Of course, the film crew, photographers and tourists were highly impressed. And, of course, the other shark tour operators imitated him straight away. These days, these open-mouth moves have been banned – and quite rightly. The Greate White Shark is not familiar with this sort of thing in nature. It is being paraded; essentially, it is a circus trick.